Forma bem rápida de conseguir reputação com esta facção, além de fazer as quests linkadas, é fazer a DG Pináculo Utgarde. If you are trying to reach exalted for Schematic: Mechano-hog, as most engineers are, you can see there will not be enough quests that give enough 'Horde Expedition' rep to get there. You can earn additional rep by questing in areas that give The Hand of Vengeance, The Taunka, Warsong Offensive, and The Sunreavers. These factions are 'Sub Factions' and grant spill over rep into Horde Expedition. It will be a tedious task for those trying to get it fast but if you quest in the right areas, you will be cruising your Mechano-hog in no time. 1) Run normal or heroic instances without wearing a championing tabard. I believe only level 80 instances (e.g. Halls of Lightning, CoT: Stratholme etc.) will give reputation but haven't confirmed this. This gives a total of 1375 reputation from daily quests per day (though there may be additional dailies I've not yet discovered). So once you do have the exalted faction where do you purchase the recipe? Or is it sent to only engineers in the mail? I don't understand this part , no information on a faction vendor. I was able to reach revered just before i dinged 76. That includes completing all quests in Howling Fjord, Borean Tundra, and most in Dragonblight. Easy rep to obtain just by questing/leveling. Rep can also be gained through completing level 80 instances if you do not wear another faction's tabard. I found that I got around 400-500 from normal instances and a little more from heroics. I was 12'000/21'000 after completing most of the WoTLK quest lines so gaining exalted with Horde Expedition came very quickly. You get horde expedition rep from 80 instances aswell. More from heroics than normal. To clear some stuff up. 2 - Only two reasons to get exalted, engineers for the recipe, and pvp players who want the head enchant. so most likely at 75-76 youll be revered and able to get the items, granted you will probably have better, but considering this rep is practically given to you in an easter basket makes it that much more pointless to grind and or worry about. The Horde Expedition quartermasters are located in Warsong Hold and Vengeance Landing. Getting Exalted with this 'faction' will complete the achievement 'The Winds of the North' (http://www.wowhead.com/?achievement=1011) from patch 3.0.8 onwards. So no more need to grind up the various individual factions making up the main one. If you get "exalted" with horde expedition do you automatically become exalted with all factions within? No. Read up the top. It says you would need 2/4 of the factions exalted. Just to clear things up for anyone still wondering about the rep, I leveled my rogue from 68 in Northrend by questing in Howling Fjord, Borean Tundra, and then Dragonblight. By the time I had leveled to 74 (Had finished Agmond's Hold and Wyrmrest Temple and halfway through Venomspite) I had become revered with the Horde Expedition. 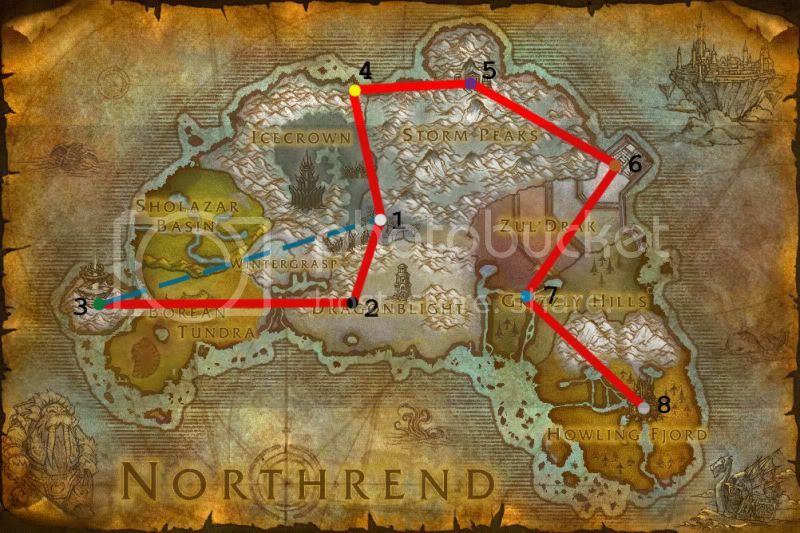 Those looking to get their Mechanohog or Head enchant, be patient and simply quest through the zones. The rep comes quickly and I imagine getting Exalted will be just as simple as Revered was. If you're looking at your profile on the Armory and the Reputation tab shows one less faction Exalted than you're expecting, it's probably this one, as it's not listed as a faction itself, but only a category. I can't work this out, I got to honoured with the Taunka and now can't find any quests to get more rep. Which instance was it? did you have their tabard? Can it be any instance? When You're exalted with Warsong Offensive, i would reccomend learning Artisan Riding from her. Just because when you're exalted with them, you get a 20% discount. That will mean, the Artisan riding skill will cost 4000g. Durr... i cant believe no one posted this yet. Kill *! @# in Utgarde keep. you get 7-9 rep for most kills in the instance and 79 rep for that flying guy. approx 340 rep per clear. With a pair of 85's (it was hard to do some of the boss fights as a solo mage, but a healer and a dps could rock this), you can clear the instance every 20 minutes. Friendly -> exhaulted in about 4 hours. Interesting to note that to date, this is still the only faction that can't be moved to inactive. your main/make a farming group in any Heroic Dungeons in Northrend. Gundrak, Hall of Lightning, Hall of Stone, Utgarde Keep, Utgarde Pinnacle and both Azjol-Nerub Dungeons on 5 man Heroic. Bosses will give you 375 rep (dont have any Tabard equipped on the character you need Reputation on). Trash will give you 21 to 64 Rep per run (per day) so there is an average of 3300 reputation each dungeon if you take everything. Its boring but can be done within 1 day with total of 12 hours farming. Also since im a Goblin and in a Guild level 25 then you'll have and the original vendor price is 400 Gold. When i reached Exalted then the Schematic costs 280 Gold. But The vendor items thats needed for Diagrama: Mecanotoca dont give much discount. The price now is Pistão Usinado por Goblins 900 Gold Peças Recuperadas de Golem de Ferro 2700 Gold and Cano de Escapamento Folheado de Elemêntio 1350 Gold. Which is total price 11 250 Gold in Vendor items. You also need Titansteel Bars, Cobalt Bolts and Artic Fur. Also since im a Goblin and in a Guild level 25 then you'll have Bartering and the original vendor price is 400 Gold. But The vendor items thats needed for Schematic: Mechano-Hog dont give much discount. The price now is Goblin-Machined Piston 900 Gold Salvaged Iron Golem Parts 2700 Gold and Elementium-Plated Exhaust Pipe 1350 Gold. The bartering skill that is provided by level 25 guilds does not apply to the parts required by an engineer to make this - Nor does it apply to Sands of Time, which are purchasable in Uldum to make the Vial of the Sands via alchemy. The goblin discount however is still available for these items. Didn't care about rep until I changed spec to Engineer. Needed rep for Mechanohog - did UP - here's my find. On Heroic UP - regs give you 3 rep, normal elite give you 50, and bosses give you 350. Quick run, but my undergeared 87 ret pally actually wiped on Skadi because I wasn't paying attention. My overall opinion is that this is a quick and easy way to exalted for non questers. Enjoy, but be cautious if you can't do 10k+ and can't self heal. You know you only got exalted with them for the Mechano-Hog plans. Don't deny it. I know, I see, I hear ALL. Good way to get rep & farm for the Blue Protodrake is to do Heroic UP runs WITHOUT a tabard that grants rep. I made the tabard mistake the first few runs. Easy solo content for 90s. I thought I would inform others who like myself was wondering how long it takes to go from No rep to Exalted. Like most people as of 2014 the chance is your reading this now because your after the Mech Hog Recipe, and like me your thinking no way do I want to quest just for that! well is NOT half as bad as your think! Set Dungeon Difficulty to 5 man HC. Make sure you have no tabard equipped. Why there is no tabard for this? What am I missing? I haven't tested it , but I believe you can have a Tabard equipped, as long as that tabard does not gain any rep.. i.e. I had on my summer skies one from Ahune quest. and it still gave me the rep. .
not that it matters. but just saying you CAN wear a tabard, just as long as it does not gain rep.. post here if that works for you! Decided to give a shot at Mechano Hog pattern and had to farm rep from scratch. Did all the quests within the Hold and Taunka to the east, did Heroic AK, AN, VH, DTK, GD, UK, UP and boom Exalted. Took roughly 2 hours on a 110 lelvel character. As forças unidas da Horda em Nortúndria, encabeçadas pela Ofensiva Brado Guerreiro.